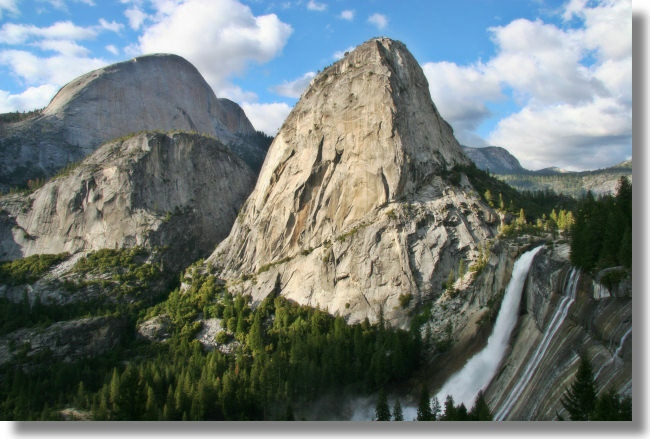 Nevada Fall is the uppermost waterfall on the Mist Trail, and since you have to hike a few miles to reach it, it's the least visited of Yosemite Valley's year-round waterfalls, unless you count Fern Spring. This view is actually not from the Mist Trail proper but from the John Muir trail, a longer but less steep alternate route to the top (or the bottom, for that matter) of the trail. Liberty Cap is the peaking rising beside the lip of the falls, and the mountain you spy at the rear of the photo is the back face of Half Dome. If you're knocked out by this scene, you can download larger versions of this photo to use as your desktop wallpaper.